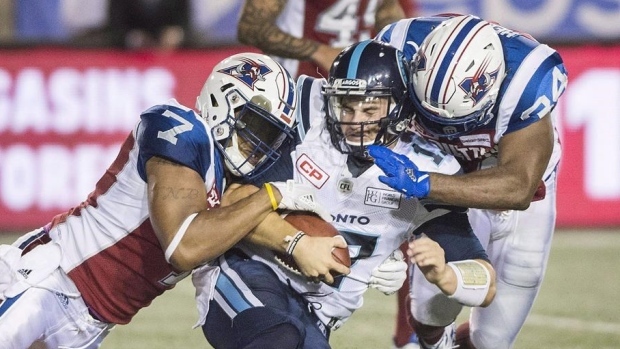 The problems continue for the Montreal Alouettes. Defensive end John Bowman could miss six weeks after incurring a partially torn bicep, and quarterback Vernon Adams Jr. will be out two to six weeks with a foot injury, according to Didier Orméjuste of RDS. Both injuries occured in the team's loss last week to the Tiger-Cats. In five games so far this season, Bowman has 13 defensive tackles and one sack. He has spent the last 13 seasons in Montreal. Adams has 220 passing yards and one interception in two games (one start) so far this season. He did not practice Tuesday. The Alouettes also added defensive back Greg Henderson to the practice roster and released receiver De'Mornay Pierson-El and defensive back Greg Ducre. The Als (1-6) are coming off a 50-11 drubbing at the hands of the Hamilton Tiger-Cats that saw Johnny Manziel throw four interceptions in his first regular-season start. They will face off against the division-leading Ottawa Redblacks (4-3) in Week 9.